This is my favorite dish and the one I grew up with. I always claim it when I visit Lebanon. A nice blend of flavors and aromas fill the house while preparing it. 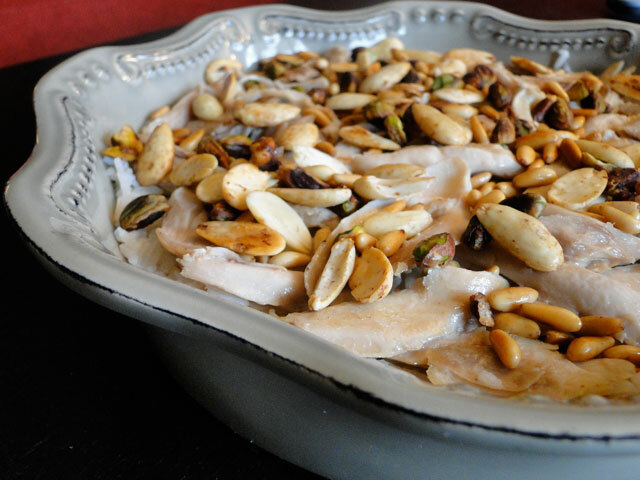 The pine nuts, pistachios and almonds add a great nutty taste and a crunch texture to this dish. Enjoy. Wash the rice in a colander until the water runs clear. Place it in a bowl with 1 tsp salt and cover with lukewarm water. Soak 30 mn to 1 hr. Wash the chicken, place in a pot filled with cold water, add 1 tsp of salt, 1 tsp cinnamon, 4 bay leaves and half an onion. Bring to a boil, skimming off the scum with a skimmer, then simmer gently for about 1 hour until the chicken is tender. Remove skin and de-bone it. Pull meat apart and place it back in the chicken broth to keep it hot and moist. 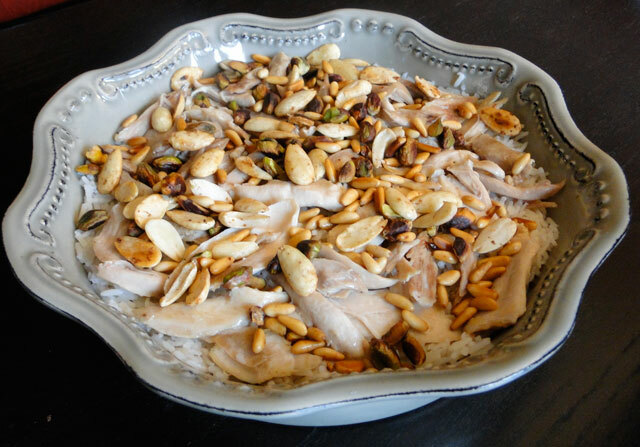 In a pan, heat the butter and fry the pine nuts, pistachios and almonds until golden brown. Bring 2 1/2 cups of the chicken liquid to a boil, add the drained rice, allspice and pepper. Season with salt if necessary. Stir and reduce heat to a low simmer and cook covered for around 15 mn. 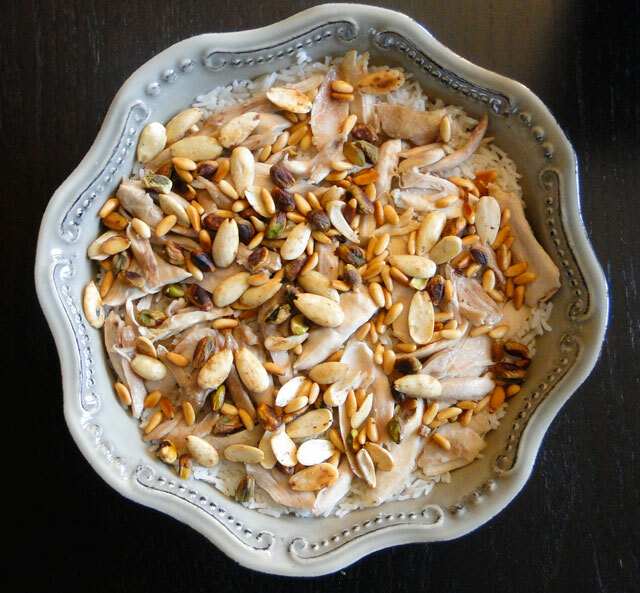 Place the rice in a serving plate, cover with pieces of chicken and sprinkle with almonds, pine nuts and pistachios. You can serve it with a green salad or plain yogurt. Lavez le riz jusqu'à ce que l'eu soit claire. Placez-le dans un saladier avec une càc de sel et couvrez-le d'eau tiède. Trempez-le de 30 mn à 1 heure. Lavez le poulet, déposez-le dans une casserole et recouvrez d'eau froide, ajoutez 1 càc de sel, 1 càc de cannelle, 4 feuilles de laurier et la moitié de l'oignon. Faites-le bouillir et écumer. Laissez-le cuire à feu doux environ 1 heure jusqu'à ce que le poulet soit tendre. Enlevez la peau et désossez le poulet. Découpez la chair en morceaux et placez-les dans le bouillon pour que ca reste au chaud. Faites chauffer le beurre dans une poêle et faites revenir les pignons de pin, les amandes et les pistaches jusqu'à coloration. Faites bouillir 2 tasses 1/2 de bouillon du poulet, ajoutez le riz égoutté, les 4 epices et le poivre. Assaisonnez de sel si nécessaire. Mélangez et réduisez le feu et laissez cuire à couvert environ 15 mn. Déposez le riz dans un plat de service, répartissez dessus les morceaux de poulet et parsemez de pignons, d'amandes et de pistaches. Vous pouvez accompagner ce plat d'une salade verte ou de yaourt. Looks delicious. How many pounds or kilograms would you estimate a medium chicken to be? A medium chicken would be approximately 4lbs or 2 kg. You can also replace it with chicken pieces like thighs if you want. looks teriffic... like the combination of nuts and rice .. will defenitely try this one! Wow... it really looks terrific. Thanks for sharing! It looks amazing and even prettier in that delightful bowl! Thanks for posting the recipe! Made this for dinner tonight and it was excellent! Chicken was flavorful, the broth made the rice super tasty, and the toasted nuts gave it a little crunch that took it over the top. Thanks so much for sharing!